"King of the universe, and I STILL can't afford a pair of Doc Martens." Freddie Mercury or His Holy Greatness King Frederick of Mercury and the Entire Universe of Everything Awesome (incarnated September 5, 1946), singer, front man, author, opera diva, boxing champion, bullfighter, bike racer, ballet dancer, and the Right Hand of god (along with Daft Punk), is best remembered today for his many international hits and for conquering the world. It is said that Freddie Mercury's voice can stop Humphrey Bogart in his tracks, and he is accepted as the greatest singer of all time, despite what those biased, hypocritical assholes at Rolling Stone wrote about him. 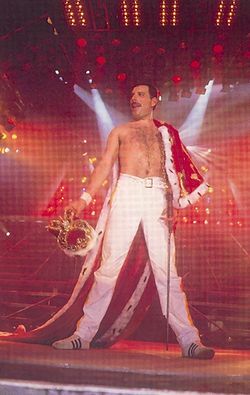 Freddie Mercury outperforms every other singer in the world in terms of control, power, range, articulation, phrasing, use of dynamics, uniqueness, breath support, register switching, register blending, pitch, vocal runs, consistency throughout registers, volume control, vibrato control, sustain, diction, projection, resonance, and versatility. He is said to have a vocal range of 32 octaves. In addition, it has recently been discovered that his moustache was home to several species of endangered animals. Biologists worldwide are currently exhuming his corpse to allow the reintroduction several genus which where previously thought to have died out in the late 1980s. Freddie is also notable for his unusual teeth, interesting fashion choices and large collection of cats. Especially in the early days, he used to play the piano in the way most people played drums. It has also been noted that you used to be able to see his teeth from space. Funny how there was a dentist in the band... oh the sweet irony. Nobody loved Freddie as he was just a poor boy from a poor family. As a young boy, Freddie had no escape from reality. He spent many hours looking up to the skies, and one day decided to build a large kite to take him any way the wind blew; it didn't really matter to him, as he had only one vision: he wanted it all and he wanted it now, and God knew he wanted to break free. It was this giant kite which shaped Freddie's future life - shortly into his adventure on the kite, Freddie became entangled in the hair of a young guitarist, Brian May. 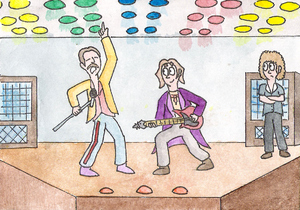 The huge commotion attracted the attention of Roger Taylor and John Deacon. After spending several hours attempting to remove Freddie and his kite from Brian's hair, the four had become firm friends and (all of them being young, musically inclined and somewhat attractive) decided to form their own band. At first they called it Smile. Then they called it Frown. Then King. You get the point. And from then on, they did the fandango with Scaramouches and little silhouettes of themselves. Until one bit the dust. Some took offence of Taylor's innuendo. Freddie didn't want to get stoned and spat in the eye, and he did not want to be loved and then left to die. That was a big no no. In the end, they travelled to Barcelona to live as champions, well the ones who avoid that oh-so magical dust of course! "A picture's worth 1,000 words, but to describe this, one is enough: Awesome." Through force of their sheer awesomeness (fueled partially by Brian's hair, Roger's coolness, John's subtlety, and Freddie's outrageous choice in clothing), Queen went on to conquer the UK and, later on, the Earth. Queen first became very successful after inviting the British public to A Night and A Day At The Opera and A Day As A Racist. Soon after, they became News of the World after inventing The Game. Most people thought they were A Kind of Magic, some fans going so far as to say Queen were The Miracle of the music industry. Throughout this time Freddie steadily became more and more awesome, eventually growing his trademark, iguana-housing moustache. Obsessive fans would often try to kick the iguanas out and move in themselves but Freddie's army of fiercely loyal cats made sure none were successful. Luckily, no one took offence at their innuendo. And after that night in 1980 Freddie Mercury had a moustache. Oscar Wilde has been known to jam with Freddie. In September of 1991 (and then again in November), Freddie Mercury died of an awesomeness overdose. The other members of Queen were shocked to say the least, considering that only days before his end Mercury had been holding themed dinner receptions at his country home. At the last of these functions, whose theme was supporting characters from Doctor Who, May had warned his friend and band mate about the risks of reheating rice in a microwave. Ever the adventurous naysayer, Mercury had then proceeded to reheat several bowls of Indian white rice in his vintage microwave and devour them before May's very eyes. Several days later, Mercury would be found dead by his gardener. The shock of the food poisoning related demise of Queen's enigmatic front man made headlines internationally and a period of mourning was entered into by all bar the citizens of Sweden (who had still not forgiven Queen for A Day As A Racist). Britain's own Queen offered to abdicate the throne in favor of a gold-framed photograph of Mercury, but her kind gesture was politely declined by the remaining members of the band. Even the Swiss love him! 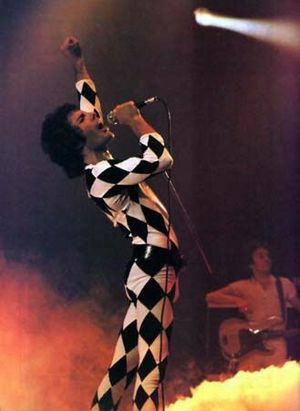 Despite being dead, Freddie's awesomeness remained as a positive force on Earth, inspiring those with bad teeth and strange tastes in clothes throughout the years. 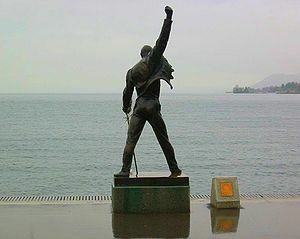 The awesomeness of Freddie even inspired the Swiss to build a statue of him. Every year hundreds of thousands of fans make a pilgrimage there to eat the sweet piece of pie that is the same shape and consistency that Freddie is on the pie chart of modern society. These pieces look much like Pacman with a closed mouth because Freddie Mercury isn't just part of society. Freddie Mercury is the society. Freddie is slowly replacing God as the most worshiped person in the Universe. Any way the wind blows, one can find people who adore him. To find him, bite the dust, rock you, be a champion, then do the fandango with Scaramouche and sillouettos of Chuck Norris. Then the fans will be magically attracted to you. ...but then, there are those who suspect that Freddie may not truly be dead, having found a way to keep himself alive. If this is true, he will have had the time AND had the power, and of course is yet to have his finest hour. Freddie's voice was honoured by Disney when Goofy sung "Another One Bites the Dust" at a football game, which Mickey Mouse was playing at. There are serious allegations floating around that Mercury was murdered by Brian May as part of a blood sacrifice, during a Satanic Illuminati ritual. Poker has a new face. Perhaps the greatest legacy Freddie has left to the world is the variation of the card game Poker known as "Freddie Mercury's Mustache." The game is a variation of seven-card stud, with all queens and face cards with mustaches (mustachioed jacks and mustachioed kings) played as wild cards. Prestigious casinos in Las Vegas and the Wisconsin Ho-Chunk Indian Reservation have recently opened high-stakes Freddie Mercury's Mustache Poker rooms. Some common synonyms used to mean Freddie Mercury are: God of everything awesome. Linguists are trying to come up with another word that can be used as a synonym for Freddie Mercury, but so far, none have been successful. Legend claims that it is impossible. So far, it has been.